This is a low/short unbranched downy perennial with broad lanceolate shaped leaves which grow opposite on the stem. The green flowers have no petals and are in stalked tassels with stamens and styles on separate plants. It flowers from February to May and is found in woods and shady places. I live in a property built on land that was named Long Stocking which means a place cleared of tree stumps so I decided to search for this plant in Rothley due to its importance as an Ancient Woodland indicator. Where were the large woodlands of Rothley? There is an abundance of Dog's Mercury in this spinney and on the roadside verge on its boundary with The Ridings. There is an abundance in both spinneys, in the boundary ditches and the verges along the fields. It grows on both sides of the road from the junction with Westfield Lane up to the far side of Hickling Spinney and a small patch by the gateway near the area used for parking. This was a bit late to be looking for the plant but on 5th April 2005 I returned and confirmed two large patches on the roadside verge just a short distance from the entrance to Brickyard Farm. This is a road of large properties and where gardeners would be keeping the large gardens looking tidy. 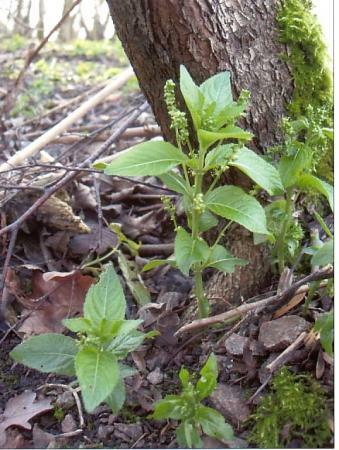 However, there is still evidence remaining of Dog's Mercury. From The Ridings towards Rothley Station I found it under the hedgerows of nos. 60, 54, 39, 46-50, 40, 38, 36 and a good patch by 24. There appeared more on the even numbered side which is closer to Hickling and Long Spinneys. Walking from Rothley Station I first found Dog's Mercury in the hedgerow and on the grass verge opposite the long white bungalow two doors down from the Rothley Park Golf Club. There was gap until I found it on the verge and in the hedgerow opposite the gate to Temple Paddock (field next to the Rothley Court Hotel). A good spread was found opposite the exit from the Rothley Court Hotel. There is a tiny copse on the corner of Westfield Lane and The Ridings and this is full of Dog's Mercury. Walking along Westfield Lane to its junction with Woodgate, path side only, there was a scattering of it and extended as far as the first bungalow on Woodgate near the junction with Templar Way. This is on land shown in the old field names as 'stocking'. A good patch was found in the spinney beyond the paddock close to the banks of the Rothley Brook as it flows to the back of the Rothley Court Hotel. This is only a field away from the abundance on The Ridings/Westfield Lane. This is an interesting find as it is again on the banks of the Rothley Brook close to the bridge which carries the Great Central Railway. It is near a small unmanaged spinney. This disused line carried the stone from Mountsorrel Quarry to the Swithland Sidings. 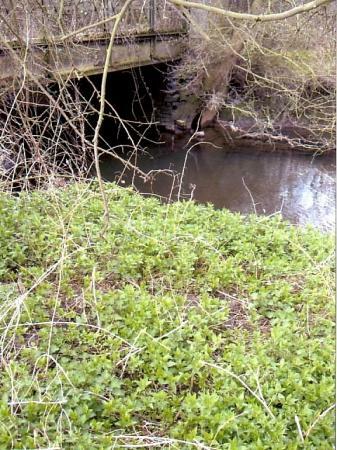 There is a lot of Dog's Mercury in the area close to the reservoir but it does extend into the Parish of Rothley. The search continues but an interesting picture is building up of the extent of ancient woodland in Rothley by locating this one plant. XHTML 1.0 validated. WCAG compliant. Page generated in 0.2277 seconds.